Today 6WIND announced that Arbor Networks, a network security and network monitoring company, successfully replaced its VyOS vRouters with 6WIND Turbo Router for its training network called The Wargames Network. The Wargames Network is used to simulate DDoS attacks, allowing customers to evaluate and train on its Threat Management Systems (TMS) and Arbor Edge Defense (AED). Arbor Networks was an early adopter of virtualized routing deploying nearly 100 VyOS vRouters for its training network instead of traditional hardware routers. However, performance, reliability and support requirements of the VyOS necessitated a replacement. 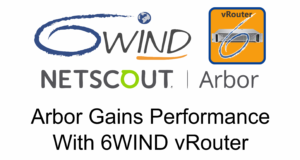 Arbor selected 6WIND vRouters for sustained performance above its 5 Gbps requirement, scalable features such as sFlow and GRE, and reliability. 6WIND is also looking for beta testers for our vRouter 2.0 software. Click here for more information and to register for our beta program. Join our 6WIND vRouter 2.0 Webinar on October 11 introducing the new CLI and NETCONF/YANG-based Management Engine.